Apheresis is a process which involves removal of whole blood from a patient or donor. Apheresis equipment is a machine which is used to remove the blood and is designed as a centrifuge, the components of whole blood are separated. One of the separated portion of the blood is withdrawn while re-transfusing the other portion. Global demand for such machines is expected to grow significantly and is expected to be driven by factors such as increasing instances of blood disorders and growing demand for blood and blood components. This report identifies the apheresis equipment market size in for the year 2014-2016, and forecast of the same for year 2021. 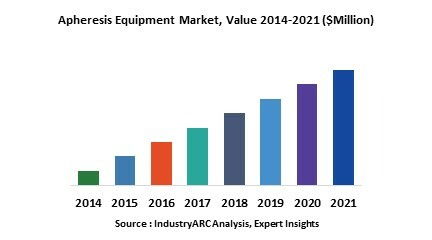 It also highlights the potential growth opportunities in the coming years, while also reviewing the market drivers, restraints, growth indicators, challenges, market dynamics, competitive landscape, and other key aspects with respect to apheresis equipment market. Globally North America dominated the market for apheresis equipment in 2015 and is expected to continue its dominance during the period of study due to higher usage and adoption of advanced medical technologies. North America was followed by Europe and Asia-Pacific as the second and third largest markets respectively for apheresis equipment in 2015. Demand for apheresis equipment in Asia-Pacific is expected to witness fastest growth in the near future due to constantly growing demand of blood components for transfusion from increasing surgical procedures and higher accidents & trauma cases, rapid development in the healthcare infrastructure in the region. This report on global apheresis equipment is segmented on the basis of various types of apheresis equipment by product type, by disease, by procedure type and market size in various geographical regions. This is report has been further segmented into major regions, which includes detailed analysis of each region such as North America, Europe, Asia-Pacific (APAC) and Rest of the World (RoW) covering all the major country level markets for apheresis equipment in each of the region. Asahi Kasei Kuraray Medical Co Ltd.